There’s nothing like the sound of your young daughter running, panting and screaming towards the house to bring your kitchen table Latin class to an abrupt halt. A few moments prior, we had been studying Latin verbs together, in complete peace and serenity of mind, when I’d realized that I wasn’t seeing the usual back yard sight for this time in the morning: that would be the our small, but picturesque, flock of ducks working their way across the grass, chatting amongst themselves and clipping off tasty breakfast morsels in the form of grass and weeds. When I questioned her, Amalia admitted that she had forgotten to let them out that morning, so we stopped for a few minutes so she could release them and feed them their breakfast. Back to the screaming. “Now what,” I wondered, as she slammed the screen door and ran onto the back porch, still yelling, heavy-footed, panting. Perhaps she’d discovered that one of our ducks had been killed during the night. That was probably it. It had to be the ducks. Of all our critters, the ducks are my favorite, so I braced myself for the bad news. Maybe more than one were viciously dismembered across the yard. It had happened before. Isn’t this a delightful sight? 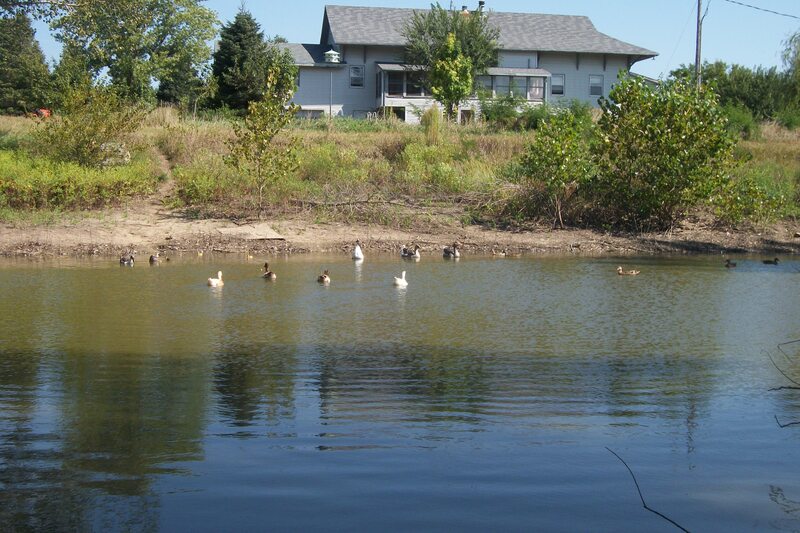 Here’s our flock of ducks on our little pond. “Mom!” she shrieked at me. “Come out! Come look! Now, Mom, now!” I studied her face. She was grinning, her blue eyes sparkling. She turned and raced back out the door. It couldn’t be a death, after all, I thought, as I took a wistful look at the Latin text and slipped on my sandals. It must be something remarkably good: a lovely moth hatched out of a cocoon, say, or a blue egret on the pond. Maybe some mountain lion tracks in the mud. Our place affords such delights on a daily basis, something I’m grateful for. Good for nature study, not so good for Latin class. As is my habit, I slipped my camera into my pocket. I stepped outside, and my daughter, waiting at the door, grabbed my hand and pulled me to the duck coop, panting and giggling with delight the whole way. Little Mack, still in his pajamas, followed us, calling for us to wait–wait–wait up! By the time we got there, I had my guesses about what my daughter was so ebullient about, but I hardly dared hope . . . Permit me a bit of backstory: a month or more ago, I’d delegated some of my morning chores, and feeding the ducks and picking up their eggs in the mornings went to Amalia. Only she didn’t pick up the eggs. She had noticed that one of our ducks, “Precious” by name, was exhibiting broody behavior, fussing with a nest full of eggs, being a little aggressive toward her coopmates. Amalia watched, and with hope in her heart, left the eggs in the nest. She thought it would be fun to have baby ducklings. 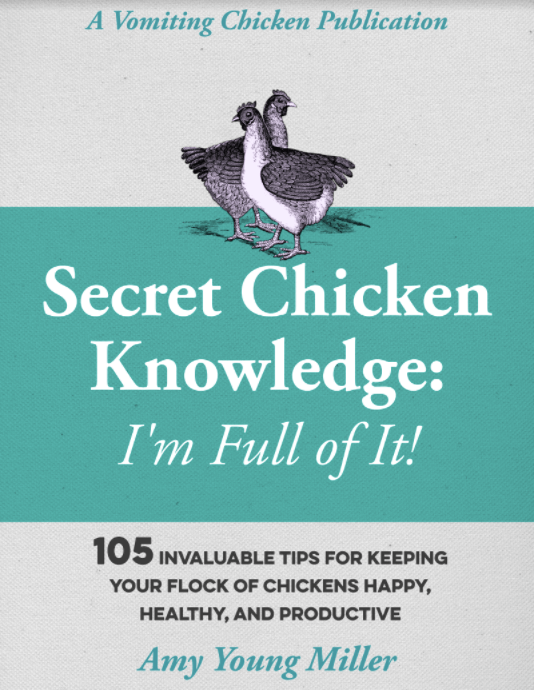 When she brought up that point in casual conversation with me at the time, I had agreed that it would be fun, but I’d also pointed out to her that in all the years we’d been keeping ducks, we’d never actually possessed a female who could accomplish the tricky task of incubating eggs successfully without getting herself eaten by a predator. 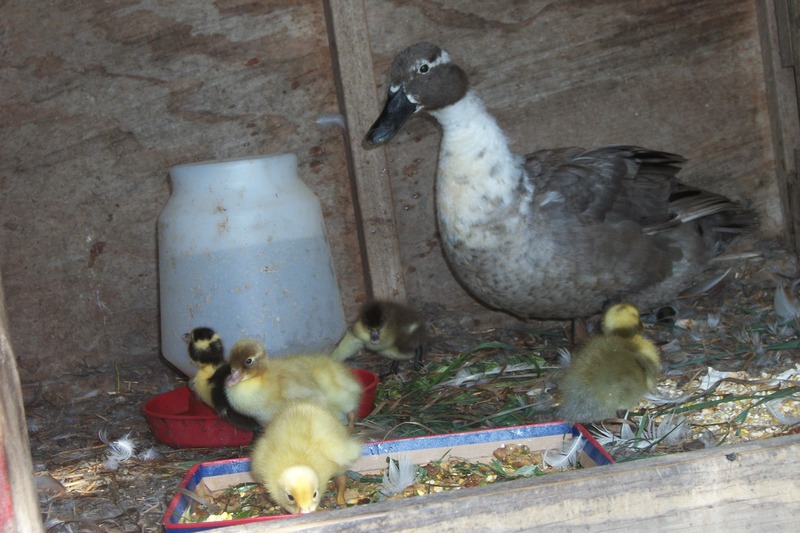 Our broody ducks tend to wander off and lay their eggs in remote places—in the windbreak, down by the pond, or in the long brome grass far away from the safety of the duck house. A savvy duck, of course, realizes that the only safe place for a duck at night at our place is in the dandy duck house that my good husband Bryan built for me, into which we close them at night. I’d like to see a nightly movie of all the predators that wander through our few acres. Well, maybe I wouldn’t. Maybe I wouldn’t be able to sleep at night if I knew what stalking and hunting and killing and dismembering went on outside our place during the nighttime hours. We’ve seen coyotes, foxes, raccoons, opossums, badgers, and have heard bobcats and seen mountain lion tracks. We’ve suspected that minks and weasels have feasted on our chickens, also, though we’ve never seen them. We’re very careful about shutting our fowl in at sundown, needless to say. But who knew that Precious was actually a savvy duck? I guess Amalia had suspected as much. The lovely duck had plucked the softest down from her breast, and then had fluffed her grey and white downy self down on a neat little clutch of eggs and claimed them, imperiously, for her own. Furthermore, she’d carefully incubated those eggs for lo, these many weeks. We had arrived at the duck house, and my daughter swung open the door of the structure with a proud flourish. There sat our Precious, proud, defensive, eyes watching our every move. From underneath her downy breast peeped several little ducklings. I gasped with pleasure at the sight, and immediately sank down on the ground with my daughter and drank in this most delightful thing. God’s creation is a thing of wonder, especially in this: that in three weeks of incubation a simple fertilized egg can change and grow and become a little handful of downy feathers, a winsome bill, darling webbed feet, and the glistening dark eyes of a duckling! Here Mama watches as her babies learn the basics of feeding themselves. 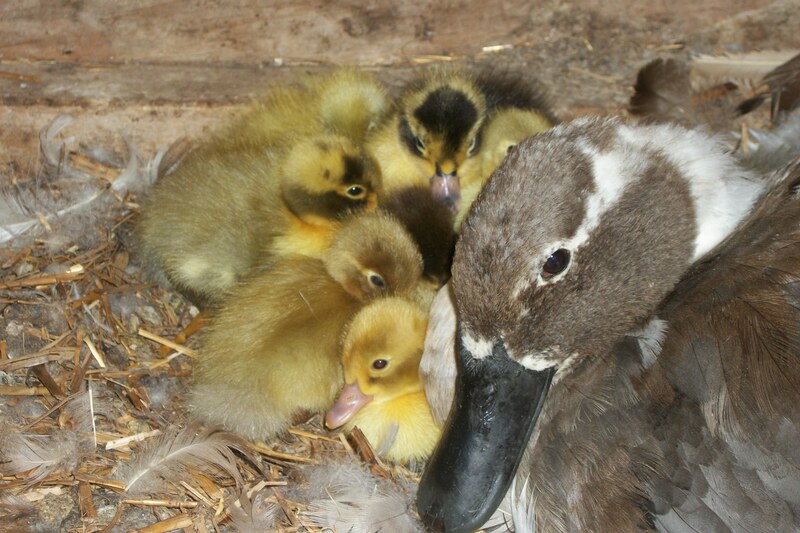 This was the very first time a mama duck had hatched out ducklings at our place, in the ten years we’d lived here. What an auspicious event! What a glorious day! It was a miracle! Now all the shrieking was forgiven, understood, even appreciated. Here she is–mama “Precious” carefully positioning herself between us and the most adorable ducklings ever seen, anywhere, anyplace. Latin class was forgotten for that morning, needless to say. Amalia’s piercing cries were not so appreciated or understood one dark and stormy night not long ago, but this story is getting a bit long already, so you’ll have to wait for Part II in this tale . . . I’ll post the conclusion on Wednesday, if you promise to visit me then to read it. It involves a stormy night, a gun, a skunk, and seersucker pajamas . . . check back with me then! 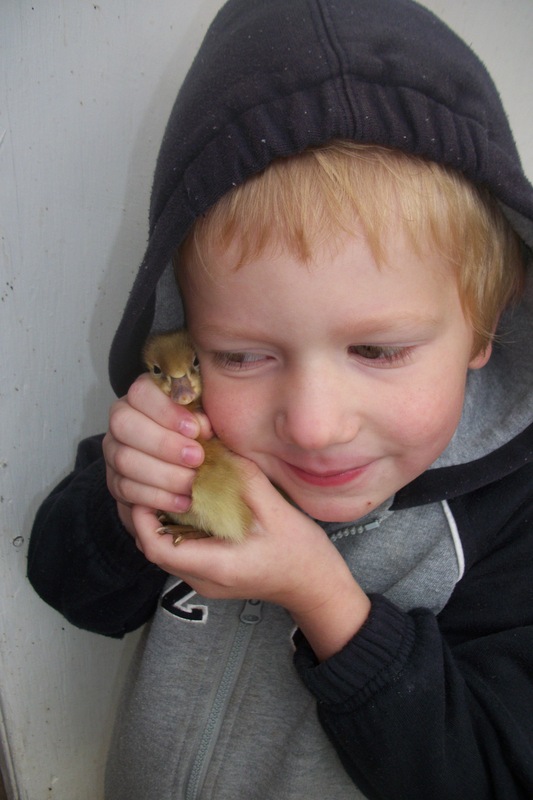 Little Mack–or should I say “Littler Mack”–discovers that nothing is as sweet and soft as a newly-hatched duckling. 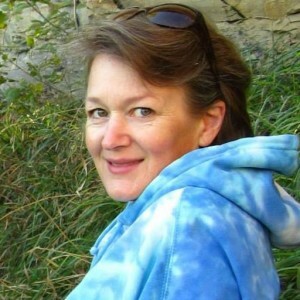 ← “The garden as metaphor” Great book on creative writing! Aw, sister. I love those little duckies. Great pictures!